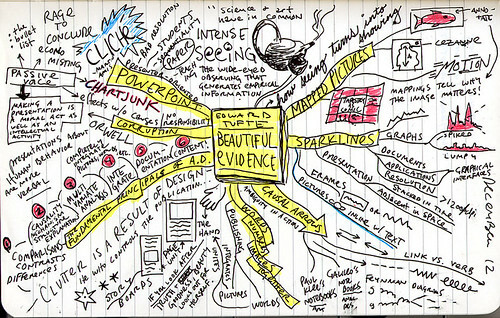 This is a mind map I did while reading Edward Tufte’s new one, Beautiful Evidence. I’ve been interested in this kind of “radial” note-taking ever since I read about “clustering” in one of Janet Burroway’s books on fiction. Graphic facilitators (like the cartoonist Drew Dernavich) do glorified doodling like this for a living. Beautiful Evidence is, like all of Tufte’s previous books, fantastic. I enjoyed the chapters on picture/word integration and PowerPoint the best. The great thing about Tufte is the primary sources he uses, and in this book, he quoted everything from Galileo’s Starry Messenger, to a guide to spotting a concealed handgun, to Martin Amis’s The War Against Cliche. My working method has more often than not involved the subtraction of weight. I have tried to remove weight, sometimes from people, sometimes from heavenly bodies, sometimes from cities; above all I have tried to remove weight from the structure of stories and from language….Maybe I was only then becoming aware of the weight, the inertia, the opacity of the world — qualities that stick to writing from the start, unless one finds some way of evading them. The map is GORGEOUS. I’ve never seen one in color before. Do who gestalt understandings come back to you when you look at it?